This is a combination of two worlds: animation by Walt Disney, which has been known for decades, and the universe of "Final Fantasy", a brilliant series of video games. In this way, in the field of entertainment and pop culture, America meets Japan. 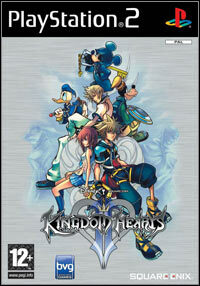 KINGDOM HEARTS II for the PlayStation®2 follows Sora, Donald, and Goofy on their continuing quest to find their friends and King Mickey. Haley Joel Osment (Secondhand Lions, The Sixth Sense) reprises his role as the main character Sora and is joined by Ming-Na (ER, Final Fantasy: The Spirits Within) who voices Mulan and James Woods (Be Cool) who returns as the villain Hades, along with a slew of soon to be announced celebrity voices. It has been a year since the events of KINGDOM HEARTS CHAIN OF MEMORIES. The story begins in Twilight Town, a quiet burg nestled between night and day. Sora and friends are joined by a vibrant new cast of characters, including the king himself! In the effort to help Mulan and stop the villain Hades' devious plots, they will encounter countless dangers both familiar and brand-new. Game score 8.6 / 10 calculated out of 433 players' votes. Expectations before the premiere: 9.7 / 10 calculated out of 55 players' votes.